Photo by Jadah Stansfield/ Cleveland Storm ruled the field in the team’s first home game two weeks ago. At the Ask Academy, the focus is on STEM and academics — but that doesn’t mean scholars are not interested in sports. Scholars at our school often juggle their academic day with long hours of practice for teams at other schools. Others enjoy going to the big games at Cleveland and Rio Rancho on the weekends. Two weeks ago, the first official game of the high school football season was held at Cleveland High. The match was between Cleveland Storm and the Manzano Monarchs, and the turnout could not have been better. Both sides of the stands were packed with cheering fans. Sitting in the crowd, mere minutes before the start of the game one could practically taste the excitement and anticipation in the air. Then suddenly a thunderous boom broke the silence and the teams charged on to the “battlefield,” ready to take home the victory for their school. The energy from the players was infectious; as the game commenced each team trying their hardest showed off their skills for their fans. Cleveland started strong with several tackles at the ten and fifteen yard lines. Manzano was also active in their defense, taking the Cleveland players down at the five and ten yard lines. The Ref seemed to have learned from the scrimmage game the week before; no players were hurt in the process this time. He was faster and used better judgement when making his calls.In the first quarter Cleveland dominated the scoreboard with the impressive score of 26-0. As the game came to a close the audience was treated with a performance by the Cleveland Marching band and dancers. After the performance Cleveland passed the spotlight to to Manzano as they brought out the jersey of Jaydon Chavez-Silver, a player who was shot and killed at a house party at the end of last year’s school year.Chavez-Silver would have been a senior this year. They payed their respects by carrying his jersey with the number 21 between two mates around the field. This first game highlighted the lengths that players will take to show respect and sportsmanship. It’s shaping up to be an interesting season. 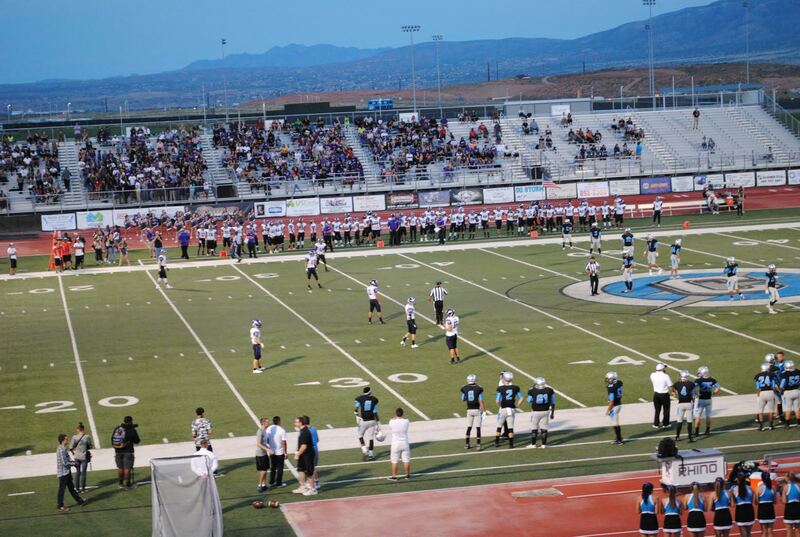 Last Friday night was loud and crowded at the Rio Rancho High School football stadium. Aside from the rain, it was a hyped-up, energetic night. Sitting in the crowd, there was a new face at every angle. Football players from El Paso, Texas invaded the Rio Rancho field. El Paso had the upper hand by scoring first, from there, all the Ram’s fans were sitting on the edge of their seat. When half time came along, the audience was treated with a performance from the Rio Rancho High School dance team and marching band. The dance team did what they always do; their formation was a bit sloppy and it wasn’t the most exciting performance. The band, however, stole the halftime show with their amazing formations and choreographed moves. Once halftime was over, it was game on, but the crowd had lost interest at that point. It seemed that everywhere one would turn, at least one person in the crowd had a selfie stick or their attention elsewhere. Muffled conversations could be heard from all around, and no one really seemed to be into the game. The Rams held their score at 12, El Paso continued to increase their score by seven for every touchdown. The game’s final score was 12-28. El Paso took the Rams chance of renewing the undefeated title they had earned last year. The first home game of the season proved to be disappointing.